StarCraft 2: Heart of the Swarm is an expansion pack to the most popular military real-time strategy in the world. This pack will contain the additional missions for single-player mode and brand-new changes for multiplayer mode. 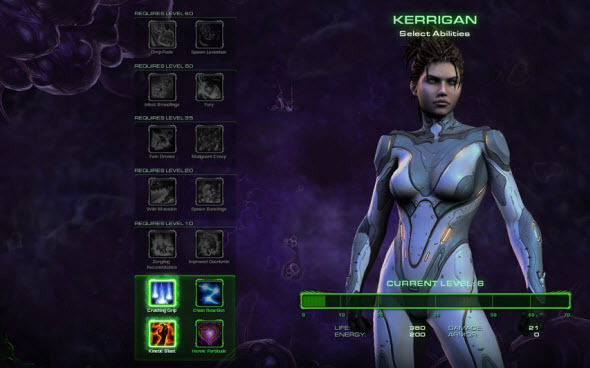 The single-player campaign will be focused on Zerg species and Sarah Kerrigan will again become one of the most important character in the game. The events of StarCraft 2: Heart of the Swarm start right after the end of the storyline from the previous game in the series. But here many units were redesigned, and also the RPG-structure of leveling was developed. Now Sarah has a tree of skills, that unlocks after each level up, and can be customized by gamer. Also in the Heart of the Swarm pack our protagonist can visit Evolution Pit and manage the mutation of her species. StarCraft 2: Heart of the Swarm release date is scheduled for the 12th of March. To get to know more about fantastic features of StarCraft 2: Heart of the Swarm pack, watch two new videos, that were revealed today. The first one tells us about the story of Sarah Kerrigan and the second one - about changes and innovations in the game. More interesting news about StarCraft 2: Heart of the Swarm and other video games are waiting for you in our Facebook community. By the way, also new contest has been announced there.